Can I Drink Weight-Gain Shakes to Gain Weight Without Exercise? If you want your number on the scale to go up, drinking weight-gain shakes without exercising can do it. However, those extra pounds you put on will be more flab than muscle. For healthy weight gain, a little exercise can make a big difference. Consult your doctor before making changes to your diet or exercise routine. Just like weight loss, weight gain requires a shift in your caloric intake; you need to consume more calories than your body currently burns. To gain 1/2 pound to 1 pound a week you need to add an extra 250 calories to 500 calories a day to your daily caloric intake, above what you need to maintain your weight. However, it's important to point out that calorie needs for weight gain vary from person to person due to genetics and activity -- or lack thereof, if you're not exercising -- according to the McKinley Health Center. Weight-gain shakes are a convenient way to add those extra calories to put on the pounds. Not only are weight-gain shakes convenient, but they also come in a range of calories, from 220 calories per serving to as much as 1,400 calories per serving. In addition to calories, these shakes also contain a mix of carbs, protein and fat, along with vitamins and minerals, making them a source of balanced nutrition. That gives weight-gain shakes an advantage over processed and fast foods, which are high in calories but low in nutritional value. Eating a variety of whole foods is your best bet for an overall healthy diet, however, and shakes should be an addition to real food, not a substitution. High-calorie weight gain shakes meant for body builders may contain additional supplements geared toward muscle building. However, if you're not exercising, these supplements may not offer any added benefits for weight gain. 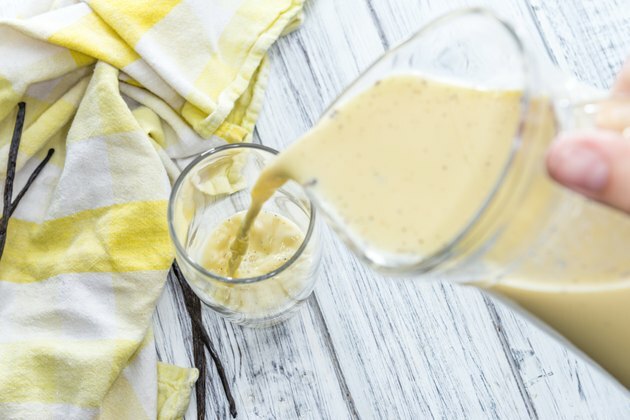 Weight-gain shakes are a good high-calorie snack option to help you take in more calories, or you can serve them as a beverage at mealtime to promote weight gain. Use a weight-gain shake as the liquid base for your hot oatmeal or blend a weight-gainer shake with frozen Greek yogurt for a healthy milkshake. You could also use the shake to make a smoothie. For example, a vanilla-flavored weight-gain shake mixes well with blueberries, strawberries and kale. Or, if you prefer chocolate, mix it with a banana, spinach and peanut butter for a tasty high-calorie treat. The shake can also be used in place of milk in pancake and waffle batter. A well-rounded weight-gain program includes both diet and exercise so that the weight you gain is muscle and not fat. While it's OK to gain some fat when you're trying to gain weight, gaining too much fat is bad for your health. A 2014 report published in Progress in Cardiovascular Diseases found that people with a healthy body mass index and a high percentage of body fat were more at risk for metabolic disorders and heart disease, and at greater risk of death from these illnesses than people with a high BMI. For best results, you want to include exercise with your weight-gain shake. Aerobic exercise is good for heart health, but it may burn more calories than you want, making it harder for you to gain. But that doesn't mean you should skip it, but keep it light at a moderate-intensity, such as a brisk walk two to three days a week for 20 minutes to 30 minutes, to minimize calorie burning. Most importantly, when you're trying to add weight to your frame, include strength-training exercises to build muscle instead of fat. A good program should work out all your major muscle groups, including arms, back, legs, chest and back, two or more days a week. Weight-lifting, body resistance exercises and yoga are considered good muscle-building workouts.